This page is under construction. Please keep informed via our Twitter feed for further developments related to Project KALA. Throughout Africa, local languages and dialects are still taught in schools as a child's first language. However the lack of appropriate reading materials means that whilst many children may be able to speak their mother tongue, many leave school not being able to read or write in their own language. As a consequence, the ability to pass on a region or even nation's heritage, culture and identify to future generations is dramatically being lost. We believe storytelling in classrooms is not only key to improving literacy uptake rates and driving down poverty but is also fundamental in terms of a developing a child's own imagination, aspirations and sense of self identity and net worth. That is why we have established Project KALA (Keeping African Languages Alive). 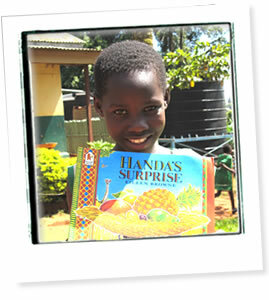 Working with various partners we aim to print and distribute 3,000 copies of an appropriate children's early reader stories in local languages to supporting partner charities, education departments and schools. You could help us enormously by spreading the word, telling your friends and family about #ProjectKALA and making a donation. We have teamed up with Walker Books and Crowdfunder to raise funds for our very first translation project which aims to distribute 3000 copies of Handa's Surprise in Fante to schools in the Elmina region of Ghana. Share the video and the Crowdfunder website link and we hope they will join us too. Success breeds success and we'd love to roll this out to more books, more countries and more languages to help as many young people as we possibly can.